On Friday, September 28, the Community Center for the Performing Arts proudly welcomes Japanese Breakfast to the WOW Hall along with special guests Ought. And yet, Soft Sounds From Another Planet isn’t a concept album. Over the course of 12 tracks, Zauner explores an expansive thematic universe, a cohesive outpouring of unlike parts structured to create a galaxy of her own design. In the instrumental “Planetary Ambience”, synths communicate the way extraterrestrials might, and on the shapeshifting single “Machinist” -- which Zauner has been performing live for over a year now -- she details the sci-fi narrative of a woman falling in love with a machine. The track, which begins with spoken-word ambience, moves into autotune ‘80s pop bliss and ends with a sultry saxophone solo, perfectly marries the experience: there’s a perceptible humanity in mechanical, bodily events. Within its astral production, much of Soft Sounds From Another Planet stays grounded. “Road Head” is the last chest compression in attempt to resuscitate a doomed relationship, while the penultimate track “This House” is an acoustic dirge that honors Zauner’s chosen family. The baroque pop “Boyish” has a haunting, crystalline clarity that recalls the pathos of a Roy Orbison ballad, while “Body is a Blade” embraces the dark intimacy of Zauner’s Pacific Northwest heroes Elliott Smith and Mount Eerie. With help from co-producer Craig Hendrix (who also co-produced Little Big League’s debut) and Jorge Elbrecht (Ariel Pink, Tamaryn), who mixed the album, Zauner recontextualizes her bedroom pop beginnings, expanding and maturing her sound. The sheer massiveness of the big room production on Soft Sounds From Another Planet introduces listeners to a new Japanese Breakfast. Zauner’s familiar, capacious voice will serve as their guide. There’s discernible pain in the phrasing, Zauner recognizing limitation, a lack of control, but then subverting the feeling, creating her own musical language for confronting trauma. 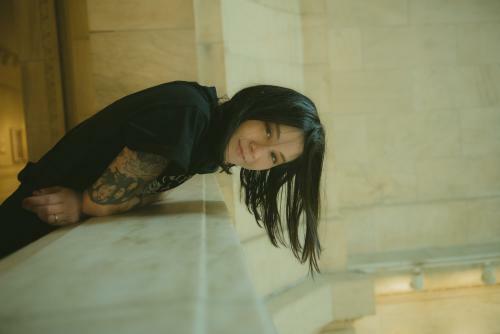 Where Psychopomp introduced the world to Japanese Breakfast, Soft Sounds dives deeper. It builds space where there is none, and suggests that in the face of tragedy, we find ways to keep on living. After two critically acclaimed albums, 2014’s More Than Any Other Day and 2015’s Sun Coming Down, the Montreal quartet of Tim Darcy, Tim Keen, Matt May and Ben Stidworthy are supporting the release their third album. And it’s a bona fide stunner. Stereogum called Ought’s third record and Merge debut Room Inside the World, “a rewarding new chapter… the album finds the band going in exciting new directions.” Today, Room Inside the World is available now on CD, LP, and white Peak Vinyl in the Merge store and your favorite independent record store. Ought kicked off their North American tour with shows in Montreal, Toronto, Chicago and the Austin SXSW Festival. Tickets are $16 in advance or at the door. Doors open at 7:00 pm and showtime is 7:30.